No matter where you live in Nassau County, NY, you, your workers and your family could be in danger from asbestos. This hazardous mineral, invisible though it is, can be a killer. 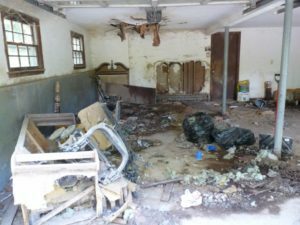 We can help you detect it and handle the asbestos removal and asbestos abatement with a professionalism borne of 25 years experience in Nassau County. If your home or commercial property was built before 1978, it is a good bet asbestos was used in the building materials. Asbestos, selected for its strength and fire-resistance, was used in plaster and sheetrock, asbestos insulation and siding, asbestos roof shingles and floor tiles and even is found in all those “popcorn” ceilings. The materials degrade as the building ages and invisible asbestos fibers are released into the air, and lungs of those exposed. Asbestos exposure can cause cancer, Asbestosis, pneumonia and Mesothelioma and you must get rid of the hazard today. We first have the presence of asbestos detected by an independent testing firm who samples the air. Then we send in our certified, licensed and insured team to seal off the area, creating a safe zone around the hazard. Next we wet the material and use negative air machines to ensure no more asbestos escapes. Then we begin the asbestos removal process and carefully scrap or remove the asbestos and dispose of it off-site according to regulations. Finally abatement begins wherein we seal off any area we have exposed, carefully clean the zone using filtered equipment and retest the air. Once it has been shown clear of asbestos, we return everything we have moved to its original location and allow your workers or family back into the now healthy building. If you are searching for asbestos removal or abatement services in Nassau County, NY, call us at (877) 645-1428.